The Brooklyn of 2015 is associated with being hip and trendy; a once counterculture locale turned into one of the most desirable places to live on the planet. It’s home base for the American Dream; a hotspot where you can expect to spot Aziz Ansari drinking elderberry kombucha while jotting down scene notes in an artisanal moleskin; a fantasy land that environs the hottest up-and-comers and gives birth to the most in vogue fads while taking in loads of new arrivals by the truckload. John Crowley’s Brooklyn stands in stark opposition to many of the things that Brooklyn represents today. It’s not hip, it’s certainly not trendy and it bears its heart on its sleeve in a way that most of the millennials occupying the various boroughs would not dare display. Rather, the Nick Hornsby-penned immigrant romance is about as earnest as they come, forthright in its good intentions and ultimately charmed beyond compare. 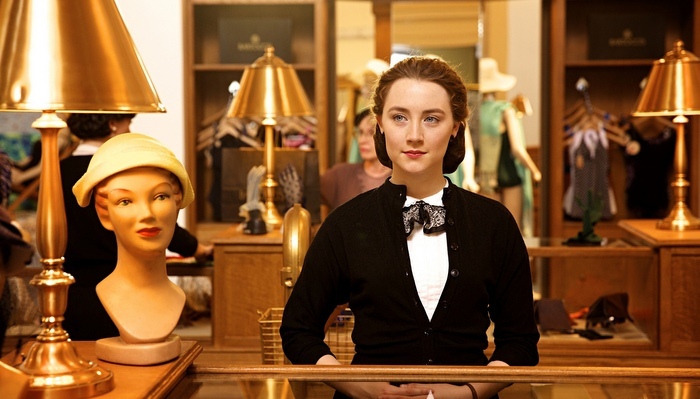 An Irish immigrant (Saoirse Ronan) makes her way to Brooklyn to escape the perceived dead end of a life lingering in her homeland. There is nothing pushing Ronan’s Eilis (pronounced EH-lish) out from Ireland – the fact that there’s few jobs, especially for a girl of her preternatural intelligent, doesn’t help. Nor does an overbearing, fatigued mother (Jane Brennan) provide much impetus to hang around. The fact that everyone knows your business (a truism that can only exist in a small town) also proves to be particularly irksome, especially for a youth trying to carve out a name and reputation for themselves that wants little to do with the windows they broke playing baseball as a 12-year old. But community is a hard thing to shake off and a harder thing to live, especially when you’re pulled away from all you’ve ever known. Eilis is not escaping so much as hunting for greener grass and this internal sense of propulsion aids in setting the aching tone of Brooklyn and well-meaning but trepidatious machinations of Eilis. In the 1950s, Irish immigrants flocked to America in storm. Following on the tail of WWII and the Great Depression, a boon of Irish communities that had set up shop in Brooklyn throughout the 19th century meant consistent jobs, prevalent Irish culture and a tight-knit commonwealth awaited the rough 15,000 Irish immigrants settling there. As Eilis soon discovers, 1950’s Brooklyn wasn’t a bad place to be a woman either. The jobs were plenty and the opportunities vast. Ellis soon finds herself working at an upscale department store – like many of her flock, Eilis’ work is set up through the Catholic church by kindly priest Father Flood (Jim Broadbent) – and going to school at night to learn bookkeeping. It’s no coincidence that her sister Rose (who was instrumental in Eilis’ transplanting to American) is herself too a bookkeeper. Their relationship is one of mutual respect and glowing kindness. Emotional welts grow when the two share their letters back and forth. Too rare are movies with such good-natured people just trying to do each other right. It’s tragic and bittersweet and real. Days of genuine heartache are cut with uproarious dinner scenes that have Eilis’ new housemates bickering and broiling over the latest slice of community gossip. Julie Walters as an opinionated landlady is a particular standout and sets the table for some unexpectedly hard-hitting comedic beats. Credit is due to Hornsby who adapts Colm Tóibín’s novel with confidence and compassion, casting shadows of doubt in some places and planting explosions of warmth in others. Behind the camera, Crowley balances the tender feelings of homesickness in with the situational comedy that comes with attempting to discover oneself in a new place. The union of Crowley, Hornsby and Ronan is, for lack of a better word, inspired. The sense of goodwill brought to live by the trio is felt in Michael Brook’s somber score that blends Irish traditional folk songs in with soft-spoken and elegant piano ballets. His work is simple and soaring, a beautiful tribute to a touching film. As Eilis finds herself confronted with choosing between two suitors (and, by extension, two worlds) Brook’s work gives each their own musical cadence and tempo. Both newcomer Emory Cohen as a New York-born Italian with a fetish for the Irish persuasion and veteran Domhnall Gleeson (who recently starred in another wonderful romance (with a sci-fi bent) About Time) are excellent but it’s truly Saorise who steals the show. She’s able to realize this character with small but confident steps, opening herself up to new possibilities as she tries to discover her path. She opens up like a delicate flower introduced to the sun, color escaping her face and then flushing it in moments of panic or excitement. Expect awards nominations to rain down upon her like an Irish rainstorm. That her journey is strikingly universal – anyone who’s ever moved away from home has experienced similar pangs of doubt and longing – makes it all the more potent. Take as contract last year’s The Immigrant starring Marion Cotillard in which a Polish girl fresh to America is sent into a woeful spiral of victimization and abuse. 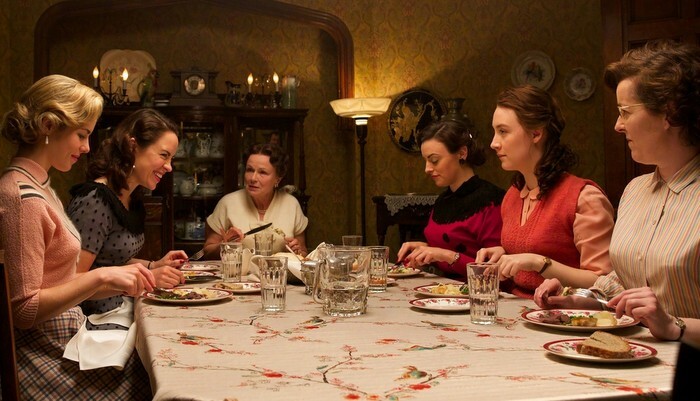 Brooklyn achieves all the emotionality that hoped for but achieves it through good-heartedness, gentle humor and lovingly cared-for characters. It never quite broke into truly superb territory (perhaps the somewhat limited narrative scope kept me from going ga-ga) but the pieces are all so outstanding that it’s hard not to develop a deep-seated crush for Brooklyn and everyone involved with it. CONCLUSION: Unnaturally tender and totally good-natured, ‘Brooklyn’ is an undeniably lovely film made with passion and acted to the nines. Anyone seeking a good date night flick need look no further. This entry was posted in Out in Theaters and tagged Brooklyn, Domhnall Gleeson, Emory Cohen, Jane Brennan, Jim Broadbent, John Crowley, Julie Walters, Nick Hornsby, Out in Theaters, Reviews, Saoirse Ronan. Bookmark the permalink.